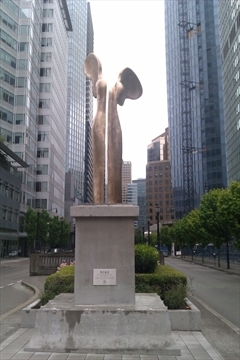 The Nike statue was a gift to the City of Vancouver for being the host city of an Olympic Games. It wasn't installed for a few years after the Olympics because it took the City some time to determine where to place it. Not many people actually see the statue because it is in the middle of a street and doesn't get too many people walking by it. It is a beautiful statue and it is worth going out of your way to see it! took years for city of vancouver to find a place for it. Presented to the City of Vancouver by the City of Ancient Olympia, Greece, site of the original Olympic Games and source of the Olympic flame, to commemorate the 2010 Olympic and Paralympic Winter Games. 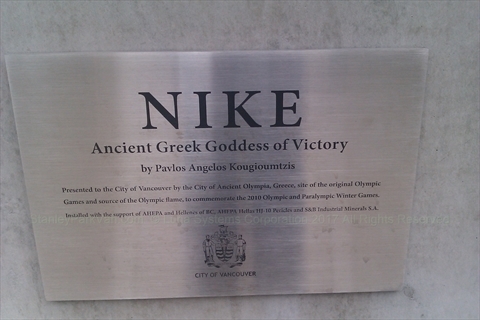 Installed with the support of AHEPA and Hellenes of BC, AHEPA Hellas HJ-10 Pericles and S&B Industrial Minerals S.A.
Where is Nike Statue near Coal Harbour in Vancouver? The Nike Statue is located on the corner of Thurlow and Cordova streets. This is a block up from Jack Poole Plaza and the Vancouver Trade and Convention Centre .